Fiction lovers be warned: you will love this novel by Rachel Cusk! 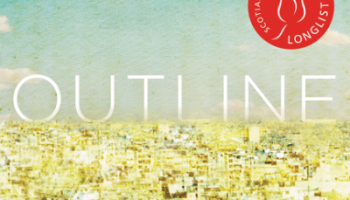 Outline is a novel without apparent plot yet it tells many stories. Our narrator is travelling to Athens to teach a creative writing course. We learn very little about her save for this bit of personal history, yet we learn so much at the same time while eavesdropping on her conversations with the people she meets in her travels. The neighbour on the airplane, the writer friend, the students in her course, and more interesting people pontificate on their particular view of life, relationships and a variety of subjects. As book’s close, you’ll ask yourself what has actually happened in this book. Not much, if we are thinking of a traditional plot. However, the beauty in this “outline” of a novel is the exploration of life’s mysteries and perspectives through lived experiences. It asks how we relate to other people and how their lives have shaped their outlook on life. To say this novel is spellbinding is not an overstatement of its merits. Brava Rachel Cusk!